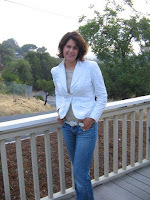 Today I'm interviewing Tricia Goyer who is the author of seven novels, six non-fiction books, and one children's book. Tricia was named Mount Hermon Christian Writers Conference "Writer of the Year" in 2003. In 2005, her book Life Interrupted was a finalist for the Gold Medallion. Also in 2005, her novel Night Song won ACFW's Book of the Year for Long Historical Romance. In 2006, her novel Dawn of a Thousand Nights also won Book of the Year for Long Historical. She's written over 300 articles for national publications and hundreds of Bible Study notes for the Women of Faith Study Bible. Tricia lives in Montana with her husband and three kids where she homeschools, leads children's church, and mentors teenage mothers. Q - Tricia, why do you think people like household hints? A - We don't have time to spend HOURS on our home. Tips help us work faster and smarter. Q - Do you have a favorite and/or interesting household hint you'd like to share? A - Sharpie markers work GREAT for covering up scratches in wood. Just find a shade (brown) similar to your piece of furniture. Q - What's your biggest housekeeping challenge? A - I am always behind in 1) putting clean laundry away, 2) mail, and 3) sweeping my floors. They always seem dirty! Q - If you could pass along one bit of cleaning/organizational advice to someone just starting out with their first home, what would it be? A - Houseclean in short bursts ... don't wait for it to pile up. Dishes only take five minutes after a meal. It takes five minutes to wipe down a bathroom if you do it every other day. Also, if you're going to watch TV, then do something little besides, such as fold laundry or dust the living room. Q - Fill in the blank: I am to cleaning as _____ is to ______. Q - How does your housekeeping style compare to that of your parents when they were your age? A - My mom was EXTREMELY neat. Everything was perfect. I'm messier, but mostly because I homeschool and write. We have people around here 24/7. Thanks so much, Tricia! Readers, be sure to check back soon for another exciting interview. And if, like Tricia, your floors always seem dirty, make sure you've got mats inside and outside every exterior door, as that really helps to cut the dirt. Also, think about getting a rechargeable vacuum cleaner that's light and easy to use, or at least a portable central vacuuming unit (like my SweepEze from Westinghouse that I profiled in a previous post.) I'm a big fan of whatever makes the job of floor-cleaning that much easier. Until next time…keep it clean! Win a Box of Brand New Books! This is a post from the Chapter-A-Week folks. It's hard enough to find books that are just right for everyone. Chapter-a-Week gives readers the opportunity to read sample excerpts from a broad range of Christian fiction every week without having to paya cent! Plus it's a great way to discover new authors you might not have found otherwise. We don't fill your inbox with needless emails. Only one email per week is all it takes to discover great new titles. Founded in February 2002 by beloved novelists Jane Orcutt and AngelaHunt, Chapter-a-Week has had a steadily growing readership. In honor of our 1000th member, Chapter-a-Week is giving away autographed books by your favorite Christian novelists! We'll send a box of books to our 1000th member and if they tell us that you recommended them we'll send two free books to your snail mail address too! Chapter-a-Week is a Yahoo! Group, so simply sign on to be a subscriber of the list and you'll start receiving your excerpts every Friday. Just go to: http://groups.yahoo.com/group/ChapteraWeek/ and click "join this group." Hi friends, I thought you might like to hear from some of your favorite authors about their cleaning issues, favorite household tips, and more, so I'll be interviewing some of them on this very blog. Check back often to see who pops up next! Today, I'm interviewing Kristin Billerbeck, author of What a Girl Wants and The Trophy Wives Club. Q - Kristin, why do you think people like household hints? A - Because people are convinced there is one simple answer to hold their house together and all women secretly want to have Martha's house with Mary's heart. A - Mr. Clean Magic Erasers. These things are like gold and I hoard them. They prevent repainting a wall, they get everything off of painted surfaces! I love them! A - Keeping up after four kids. It seems no matter how hard I work, someone is coming behind me leaving things along cleaned-up surfaces. Like their sole purpose in life is to obliterate flat surfaces. A - If no one ever taught you how to organize a home, hire a professional organizer. Learning the process helped me immensely. I was driving blind for fifteen years. Best $3000 I ever spent! Q- Fill in the blank: I am to cleaning as _____is to_____. A - I am to cleaning as fish are to bicycles. A - It doesn't. My mom is a neat freak. Thanks for your fun and interesting answers, Kristin! Readers, be sure to check back soon for more Q&A with your favorite authors. How do I dust lampshades? Try a lint roller, the kind that's made with sticky paper that you peel and use. Works great! When a Southern waitress inherits the Lowcountry cafe where she works, she suddenly has to balance more than just her next food order. Caroline Sweeney has always done the right thing--the responsible, dependable thing--unlike her mother who abandoned her family. But whenher best friend challenges her to accept an exciting job adventure in Barcelona, Spain, Caroline says "yes" to destiny.Then, without warning, ownership of the run-down cafe where she's been waitressing falls right into Caroline's lap. While she's trying to determine the cafe's future, handsome Deputy Sherriff J.D. Rand captures Caroline's heart. But when her first love, Mitch O'Neal, comes back to town, fresh fromthe heat of his newly-found fame as a country music singer in Nashville, Caroline must make some hard choices about love and the pursuit of the sweet life. Every Secret Thing is the story of a woman who returns home after many years away. Beth Gunnar hasn't lived in Delaware since high school graduation, but when she's offered a teaching job at Seaton Preparatory School--her alma mater--she accepts. Once there, she's faced with an unresolved loss that she and her friends experienced during their senior year. She realizes that the suicide of a favorite teacher has haunted her all her life, and she wants to find out the truth about what happened that night. There's a little bit of mystery and a little bit of romance, and ultimately it's a story of faith and reconciliation.